Ganache is a frosting used in Cakes, which is a blend of cream and chocolate. Thought why not surprise my hubby with a coffee drink using Ganache and this came out like a wonder. This milk shake have made with single cream and semi-skimmed milk using dark chocolate to reduce the calorie intake. The silky ganache and ground coffee add more flavour to the shake. Natural honey is used for an added health benefits. In a microwave safe bowl, combine chocolate chips and singe cream. Microwave for 20-30seconds and stir vigorously. Microwave for 20 seconds again and stir. If the chips aren’t all the way melted at this point, let the ganache sit a few minutes and stir again or microwave again for 10 seconds if they are still not melted. To this ganache mixture stir in ground instant coffee and allow it to cool down. 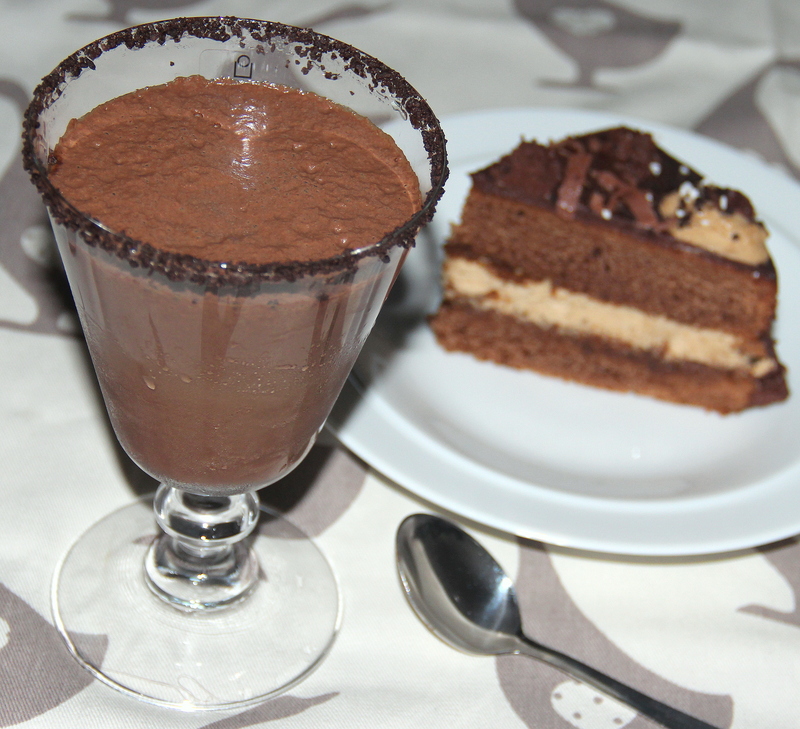 Combine milk, honey/agave nectar, ganache in a blender and whizz for 20-30seconds/until frothy. Serve as it is or with a dollop of icecream/whipped cream on top if desired. My passion is Cooking & love exploring healthy recipes. This blog is all about sharing 'Recipes for Healthy living', which are my experiments at home. Posted on September 15, 2014, in Juices/Beverages. Bookmark the permalink. 49 Comments. This is a win win I love both coffee and chocolate. YUM! Jan – It is unreal as it is finished now….Just loved its creamy texture and flavours…. Oh this looks so amazing. Chocolate and coffee…my prayers have been answered! Its a double treat for both coffee and chocolate lovers. I am both. An incorrigible one at that. Love the recipe. I am eyeing the slice of cake behind the milkshake.. did u make that too? I normally only like my coffee “hot”…but this shake looks like a winner…yummy! Wow, Chitra! What a scrumptious drink 🙂 thank you for bringing this to this weeks, Fiesta Friday, I’m sure the guests will love it! Wonderfully rich Chitra! Take out the coffee and I’d be a happy girl! I love that this is low-glycemic too! Lori looks like you are not a coffee girl like me..I make coffee drinks just for my hubby..
Good post. I definitely love this website. Keep it up! people like you! Take care! !